Hakuba is a village about 43km to the west of Nagano City. The backdrop of North Alps mountains make for a truly spectacular setting. Hakuba was host to some of the major events of the 1998 Nagano Winter Olympics including alpine skiing events at Happo-one resort, ski jump events at the Hakuba Ski Jumping Stadium and cross country at the Snow Harp venue. 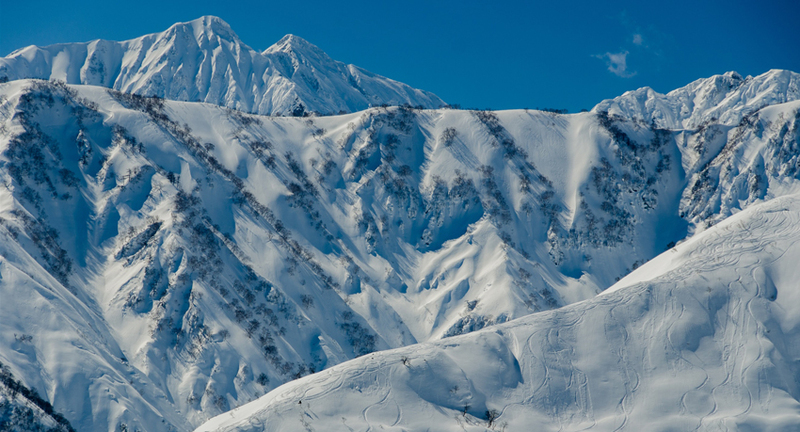 Along with the ski and snowboard resorts in neighbouring Otari Village and Omachi City, now known collectively as 'Hakuba Valley', it is one of the major ski and snowboard resort areas of Japan. Route 148 runs through the Hakuba valley region north to south. Most people approach Hakuba from the south, either coming from Nagano City, western Japan or from the Kanto regions. From central Nagano City head west on Route 19 until the Hakuba Nagano Toll Road (normal charge 210 yen). Using Prefecture Road 31 and then Prefecture Road 33, follow the signs into Hakuba. Central Hakuba village is about 43km from central Nagano City and in good conditions the journey takes less than one hour. Take the Chuo Expressway west out of Tokyo and continue Okaya Junction. At Okaya Junction, change over to the Nagano Expressway and continue north until the Azumino IC exit. After exiting the expressway, follow Route 147 and then Route 148 north into Hakuba, passing through Omachi City on the way. The journey from Azumino IC to central Hakuba is around 50km. Take the Kanetsu Expressway north to Fujioka JCT. At Fujioka Junction turn left onto the Joshinetsu Expressway and continue on that road until reaching Nagano IC. Turn right after exiting the toll booth at Nagano IC onto Prefecture Road 35 and head north for about 3.5km until arriving at the Nagano Minami By-pass (Route 19). Turn left onto Route 19 and drive by the river for around 13km until arriving at the Hakuba Nagano Toll Road. Turn onto this road (normal charge 210 yen per vehicle) and then continue straight on Prefecture Road 31 and then Prefecture Road 33 to head into Hakuba. The Hokuriku Expressway is convenient for those coming from the Ishikawa and Toyama regions as well as parts of Niigata to the north. Exit at Itoigawa IC and turn left to head south on Route 148 to the Hakuba area, passing through Otari Village along the way. The journey from Itoigawa IC to central Hakuba is about 45km. Approaching from the Kyoto and Osaka regions of Western Japan, head east using either the Meishin or Shin Meishin Expressway towards Nagoya. At Komaki JCT to the north east of central Nagoya, take the Chuo Expressway north until Okaya JCT. At Okaya JCT, change over to the Nagano Expressway and continue north until the Azumino IC. After exiting the expressway at Azumino IC, follow Route 147 and then Route 148 north into Hakuba, passing through Omachi City on the way. The journey from Azumino IC to central Hakuba is around 50km. Below are general directions from Hakuba Station in the central area of Hakuba village to each ski and snowboard resort. Note that Hakuba Station may not be the closest station to the resort. Nearest stations are noted here just for reference. 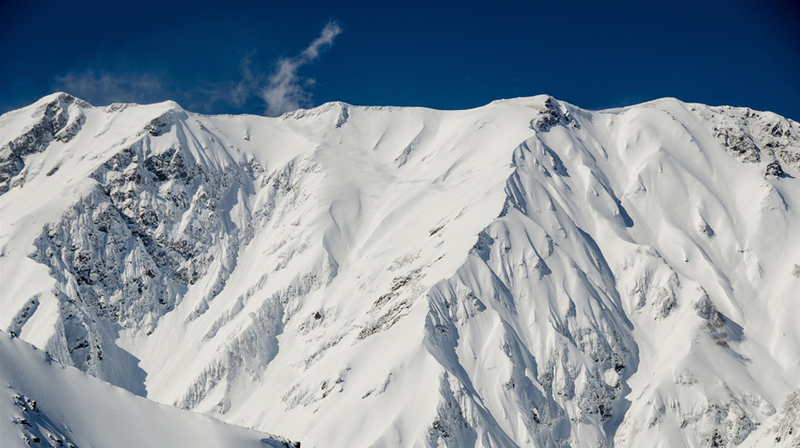 More detailed information on how to get to Hakuba by public transport can be found here. Turn left at the station on Route 148. Turn right after about 2.5km onto Prefecture Road 33 and then go straight ahead at the traffic lights. Follow the road and signs to the base of the resort. About 5.5km from Hakuba Station. Nearest station is Iimori Station. Turn right at the station on Route 148 towards Otari. Continue on Route 148 for about 8.8km. Turn left onto Prefecture 433 and follow the winding road for about 3km until reaching a sign to turn right for Hakuba Cortina. * If approaching from the north, turn right onto Prefecture 433 at the Tsugaike Kogen and Hakuba Norikura signpost before reaching central Hakuba. About 14km from Hakuba Station. Nearest station is Chikuni Station. Turn left at the station on Route 148. About 5km later, at the traffic lights just past Kamishiro Station turn right and follow the signs to the base of the resort. About 6.2km from Hakuba Station. Nearest station is Kamishiro Station. Exiting the station, use the road straight ahead (Prefecture Road 322) to head towards Happo-one. About 2.5km from Hakuba Station, which is the nearest station. Turn right at the station on Route 148 towards Otari. At the the traffic lights about 2.3km along the road (there is a 7-11 convenience store across on the right side of the junction), turn left onto Prefecture Road 433. After just under 1km, turn left to follow the signs to the base of the resort. About 3.7km from Hakuba Station. Nearest station is Shinano Moriue Station. Turn right at the station on Route 148 towards Otari. At the the traffic lights about 2.3km along the road (there is a 7-11 convenience store across on the right side of the junction), turn left onto Prefecture Road 433. Go past Tsugaike Kogen gondola station and keep straight on this road for a further 2km to Hakuba Norikura Onsen. About 10km from Hakuba Station. Nearest station is Chikuni Station. Turn left at the station on Route 148. The resort is on the right side, just under 8km from Hakuba station. About 7.8km from Hakuba Station. Nearest station is Minami Kamishiro Station. Turn left at the station on Route 148. After about 23km, turn right onto Prefecture Road 325 and follow this road to the resort. Turn left at the station on Route 148. 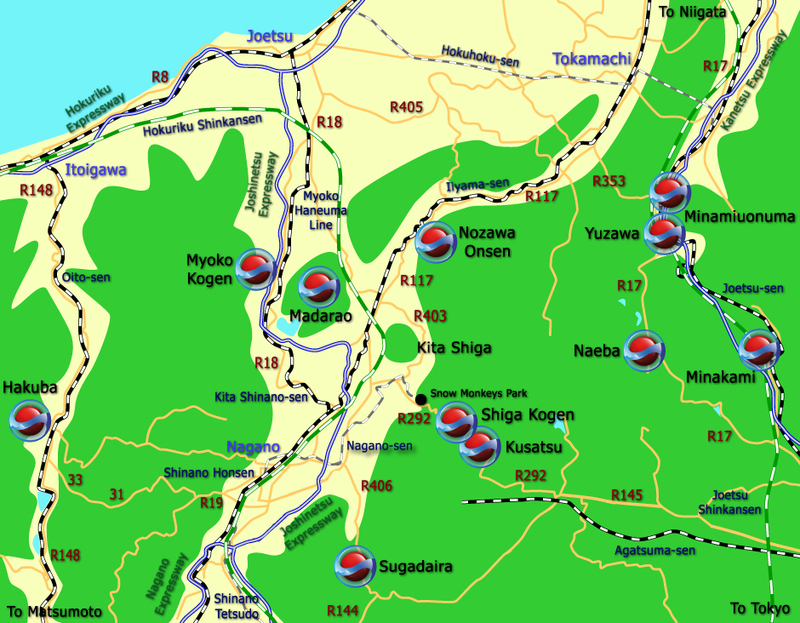 The resort is just off Route 148, about 14km from Hakuba station. About 14km from Hakuba Station. Nearest station is Yanaba Station. Turn right at the station on Route 148 towards Otari. At the the traffic lights about 2.3km along the road (7-11 convenience store across on the right side of the junction), turn left onto Prefecture Road 433. Follow this road for about 5.5km to Tsugaike Kogen. About 8km from Hakuba Station. Nearest station is Hakuba Oike Station. Turn left at the station on Route 148. The resort is just off Route 148 on the left, about 11km from Hakuba station. About 11km from Hakuba Station. Nearest station is Yanaba Skijo Mae Station. >> On the above map click on the resort names and train line for more details. From Hakuba Station in the central area of Hakuba Village, head south on Route 148 for 2.5km before turning right and then left onto Prefecture Road 33 heading towards Nagano City. Continue straight on this road and Prefecture Road 33 following the signs to Nagano for about 23.5km until reaching the Hakuba Nagano Toll Road (210 yen). After exiting the toll road, turn left onto Route 19 and continue following the signs to central Nagano. Head south on Route 148 and then Route 147 into Matsumoto. Take the Nagano Expressway from Azumino IC to Matsumoto IC if you want to speed up the last 9km or so! From Hakuba Station in the central area of Hakuba Village, head south on Route 148 for 2.5km before turning right and then left onto Prefecture Road 33 heading towards Nagano City. Continue straight on this road and Prefecture Road 33 following the signs to Nagano for about 23.5km until reaching the Hakuba Nagano Toll Road (210 yen). After exiting the toll road, turn left onto Route 19 and keep going straight on this road by the river for about 13km. The road is known as the Nishi Highway and then Nagano Minami Bypass. Turn right onto Prefecture Road 35 at the sign for the Nagano IC of the Joshinetsu Expressway. The IC is about 3.5km along this road. Join the expressway heading in an easterly direction and get off at the next exit, Suzaka Nagano Higashi IC. At the Suzaka Nagano Higashi IC exit, turn right onto Route 403 for less than 1km and then turn right onto Prefecture Road 58 where Sugadaira is signposted. Follow that road for about 6km until arriving at some traffic lights on Route 406. Turn right onto Route 406 and head up to Sugadaira. From Hakuba Station in the central area of Hakuba Village, head south on Route 148 for 2.5km before turning right and then left onto Prefecture Road 33 heading towards Nagano City. Continue straight on this road and Prefecture Road 33 following the signs to Nagano for about 23.5km until reaching the Hakuba Nagano Toll Road (210 yen). After exiting the toll road, turn left onto Route 19 and keep going straight on this road by the river for about 13km. The road is known as the Nishi Highway and then Nagano Minami Bypass. Turn right onto Prefecture Road 35 at the sign for the Nagano IC of the Joshinetsu Expressway. The IC is about 3.5km along this road. Join the expressway heading in an easterly direction and get off after about 30km at the Toyota Iiyama IC exit. At the exit traffic lights go straight ahead on Prefecture Road 96 for about 4km before turning right to head up to Madarao Kogen. From Hakuba Station in the central area of Hakuba Village, head south on Route 148 for 2.5km before turning right and then left onto Prefecture Road 33 heading towards Nagano City. Continue straight on this road and Prefecture Road 33 following the signs to Nagano for about 23.5km until reaching the Hakuba Nagano Toll Road (210 yen). After exiting the toll road, turn left onto Route 19 and keep going straight on this road by the river for about 13km. The road is known as the Nishi Highway and then Nagano Minami Bypass. Turn right onto Prefecture Road 35 at the sign for the Nagano IC of the Joshinetsu Expressway. The IC is about 3.5km along this road. Join the expressway heading in an easterly direction and get off after about 22km at the Shinshu Nakano IC exit. From the exit either go straight ahead on the Shiga Nakano Toll Road (310 yen normal charge) or avoid the toll by turning right onto Prefecture Road 29 for about 3km and then turn left onto Route 403 until you reach Route 292 just over 1km later. Take Route 292 up to the Shiga Kogen area. From Hakuba Station in the central area of Hakuba Village, head south on Route 148 for 2.5km before turning right and then left onto Prefecture Road 33 heading towards Nagano City. Continue straight on this road and Prefecture Road 33 following the signs to Nagano for about 23.5km until reaching the Hakuba Nagano Toll Road (210 yen). After exiting the toll road, turn left onto Route 19 and keep going straight on this road by the river for about 13km. The road is known as the Nishi Highway and then Nagano Minami Bypass. Turn right onto Prefecture Road 35 at the sign for the Nagano IC of the Joshinetsu Expressway. The IC is about 3.5km along this road. Join the expressway heading in an easterly direction and get off after about 48km at the Myoko Kogen IC exit. From Hakuba Station in the central area of Hakuba Village, head south on Route 148 for 2.5km before turning right and then left onto Prefecture Road 33 heading towards Nagano City. Continue straight on this road and Prefecture Road 33 following the signs to Nagano for about 23.5km until reaching the Hakuba Nagano Toll Road (210 yen). After exiting the toll road, turn left onto Route 19 and keep going straight on this road by the river for about 13km. The road is known as the Nishi Highway and then Nagano Minami Bypass. Turn right onto Prefecture Road 35 at the sign for the Nagano IC of the Joshinetsu Expressway. The IC is about 3.5km along this road. Join the expressway heading in an easterly direction and get off after about 30km at the Toyota Iiyama IC exit. Turn right at the exit onto Route 117. Continue on Route 117 for about 20km until reaching a sign for Nozawa Onsen. Turn right here onto Prefecture Road 410. After 1km turn left onto Prefecture Road 38 which takes you into Nozawa Onsen village. The resort car parks are clearly signposted on approaching the village. From Hakuba Station in the central area of Hakuba Village, head south on Route 148 for 2.5km before turning right and then left onto Prefecture Road 33 heading towards Nagano City. Continue straight on this road and Prefecture Road 33 following the signs to Nagano for about 23.5km until reaching the Hakuba Nagano Toll Road (210 yen). After exiting the toll road, turn left onto Route 19 and keep going straight on this road by the river for about 13km. The road is known as the Nishi Highway and then Nagano Minami Bypass. Turn right onto Prefecture Road 35 at the sign for the Nagano IC of the Joshinetsu Expressway. The IC is about 3.5km along this road. Join the expressway heading in an easterly direction and get off after about 30km at the Toyota Iiyama IC exit. Turn right at the exit onto Route 117. Continue on Route 117 Turn right at the exit onto Route 117 and continue heading towards Tokamachi - through Iiyama, past Nozawa Onsen and through Tsunan town - for about 50km until reaching the Route 353 turn off. Turn right onto Route 353 which is signposted as Shiozawa and Route 17. Continue on Route 353 for about 18km until reaching Route 17. From this junction turn right to head into Yuzawa town. (Turn left for some resorts in Minamiuonuma). For detailed information on how to get to Hakuba by train and public transport, please go to this section.